The Margaritaville Hotel features upscale amenities and balconies in each of 184 guestrooms, and transports guests to a vacation state of mind. Upon arrival, visitors are greeted by floor-to-ceiling lobby views of expansive lagoon pools, the sounds of the tropics and a complimentary welcome cocktail. Premium accommodations include a private balcony in every room, a rain head shower and deluxe linens. If you are traveling with a special someone or your entire extended family, we’ve got room. Private Margaritaville Cottages offer the comforts of home, including in suite baths in each room, a full kitchen, dining and seating areas. 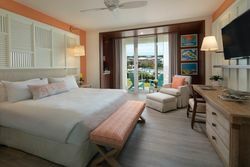 Paired with access to all of the resort amenities, a premium experience and friendly, genuine, island-inspired service.